Glen Campbell, the US country singer, musician and songwriter, has died at the age of 81. He’d been fighting Alzheimer’s disease for six years, having been diagnosed with the condition in 2011. 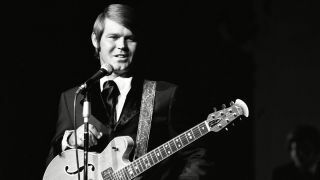 Many will remember Campbell as a television host - The Glen Campbell Goodtime Hour ran from 1969 to 1972 - but his fame and legacy were secured with a series of classic hits, many of which were penned by legendary songwriter Jimmy Webb. These include By The Time I Get To Phoenix, Wichita Lineman and Galveston. He scored his biggest hit in 1975, with Rhinestone Cowboy. Earlier in his career, Campbell had worked as a session musician as part of The Wrecking Crew, the acclaimed band of session musicians that was frequently employed by producer Phil Spector. Campbell can be heard on recordings by the likes of Bobby Darin, Frank Sinatra, Elvis Presley, Ricky Nelson, Dean Martin and Nat King Cole. He also played guitar on the Beach Boys’ classic Pet Sounds album. Campbell played his last live show in 2012, concluding a farewell tour. He then set to work on a final album, Adiós, which was released earlier this year. Many musicians have taken to social media to pay tribute to Campbell since the news broke of his passing. Here’s a selection of their posts.